As much as I love to get out and do public speaking, running a business can make it really hard to find the time to travel, deliver a presentation and keep up with the day to day operations. Especially without worrying about what you may be missing back at the office. However, tomorrow I will be heading off to deliver a new presentation on technology disruption to a crowd of primarily B2B IT executives and as I prepared a presentation on disruption I couldn’t help but think of the irony. How odd is it that I am going to drive to the airport, take 2 flights (apparently getting to Maine isn’t easy) and then a long cab ride from the airport to the event to deliver a 45 minute presentation to a group of people who eat, drink and sleep technology? It is nothing if not ironic, but at the same time the fact that we still like live human to human connections. In a recent (2013) Desoto study it was verified that we like our live interactions when more than 75% of the respondents said they want to attend more live in person events in the coming year. 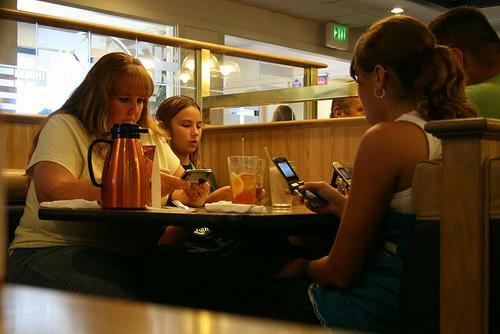 So perhaps technology is driving us to be more connected by virtual means, but as humans we still seek the social interaction. Nevertheless, the actual data says we spend far more time interacting with loved ones in a virtual capacity and this trend will continue to proliferate as technology disrupts our lives and makes it easier to keep in touch. Moving into the future the disruption will continue. Not just how we communicate with those we know, but also those we don’t know. The way brands will market to individuals and how we as individuals gain access to our digital assets. Our lives are amidst a storm of disruption, but to some extent it has become so ubiquitous to our existence that we may not even realize it. Social Media: Perhaps the most obvious of the four trends is the impact of social media, but that doesn’t make it less disruptive. With top Social Networks like Facebook and YouTube both exceeding a billion monthly active users it has completely redefined the way we build and maintain relationships. Further it has found its way into our offices, living rooms and even at our dinner tables; it has even become our preferred way of meeting people for intimate relationships. According to the same study mentioned above adults spend 20-28 hours a week on social media and on average have 275 personal connections across their social media channels. However, only 11% of the survey respondents physically see their social connections on a regular basis. To some extent this reveals what has seemed apparent for some time that social has reduced the barrier to entry for relationships but it also may reflect less meaning in those relationships. Mobility: In 2014, the mobile world will officially surpass the tethered world as far as usage goes. With 91% of people sleeping within arms reach of their mobile device, it is safe to say that we are both addicted to our mobile device and dependent on it. Mobile has also become the most popular content consumption platform as it has now passed up newspaper and magazine readership (combined) and with more than 1 billion smart mobile devices sold in 2013, mobile disruption has already taken flight. Beyond just our access to mobile devices we have also become quite productive with them. More than half of mobile users access search on a daily basis and a staggering 99% use their mobile browser each day. This trend has driven marketers to take notice as Mobility has shown strong conversion metrics since 9 out of 10 mobile searches lead to an in-store visit or a purchase. Big Data and Analytics: The word big data has been tossed around more in the last year than most people would like, but the reason people are talking about it is because it is such a big opportunity for improved marketing. Especially 1:1 messaging. For anyone using Facebook or Gmail they have probably noticed an eery correlation between what they have searched or talked about online and the advertisements they see in their stream. Am I right? This is a great example of Big Data disrupting the way brands can market to consumers. The trend however is much bigger than just advertising, it is an opportunity for brands to completely customize the human experience. With 90% of the worlds data being created in the past 2 years it is without question that the information will continue to be managed, parsed and utilized by companies to better target and manage consumer interactions. With the rapid proliferation of wearable technologies the ability for us to create data in our offline lives is becoming completely intertwined with our online experience. Pretty soon our entire existence will be one big stream of data. Both interesting and scary! Cloud: Last, but by no means least, the cloud has completely changed how accessible everything in our digital lives can be. Think about how our files, data, applications and security are all managed by the cloud? Whether we are talking about a corporate deployed private cloud or an individuals use of Office 365, Google Apps and Dropbox, the cloud has made us a lighter world as we can carry tablets or light appliance type PC’s and never be without our “Stuff.” This also invades our more traditional digital media assets such as our music, movies and photos. Anyone still have a big CD collection? Other than the collectors and hoarders, most of us would say we haven’t bought a CD in years, but our music is still with us each and every day. On the business side our CRM solutions (SAP, Salesforce) and accounting packages (Quickbooks) have found their way to the cloud and our public application providers like those “Big Social Platforms” utilize cloud infrastructure as a service from companies like Softlayer and Amazon to deliver your applications on your mobile devices. Communication as we know it is being disrupted. It lives at the center of our universe and has driven our lives both B2B and B2C to a simple common existence sometimes referred to as Peer to Peer (P2P). Social, mobile, big data and cloud have changed our lives, changed the way we communicate and will continue to revolutionize the business enterprise of the future. Over the next 4 weeks I will revisit each of these trends here on Forbes and talk more about their direct impact on the future of how we communicate.